The Philadelphia Eagles, with their top-ranked defense, were at 4-5 as they faced the Cleveland Browns on November 10, 1991. Head Coach Rich Kotite’s first season at the helm had gotten off to a rough start when star QB Randall Cunningham was lost for the year in the opening week. Backup QB Jim McMahon (pictured at right), once a title-winner with the Bears, performed ably when healthy, but that was not the case for several games when lesser performers were behind center and the offense struggled. The team lost four straight games after starting off at 3-1 before beating the Giants the previous week. McMahon was available but playing with an assortment of injuries, most notably to his throwing elbow. Cleveland also had a first-year head coach in Bill Belichick and was in transition. Seventh-year QB Bernie Kosar was still in place from the winning years in the late ‘80s, as were FB Kevin Mack and the corps of wide receivers led by Webster Slaughter. However, the Browns were hampered by some key injuries. Anthony Blaylock was starting at cornerback in place of the aging but capable Frank Minnifield and all-purpose HB Eric Metcalf, who returned punts, was also out. It was a cool, dry day at Cleveland Municipal Stadium with 72,086 fans in attendance. The Browns took the opening kickoff and drove 37 yards in seven plays, helped along by four penalties on the defense. Matt Stover kicked a 50-yard field goal for the early 3-0 lead. Three plays after the ensuing kickoff, the Browns scored again when FS Eric Turner intercepted a Jim McMahon pass and returned it 42 yards for a touchdown. Stover converted and the home team led by 10-0 with four minutes elapsed. The Eagles were forced to punt after their next series and the Browns struck quickly. Kevin Mack ran for four yards and then Bernie Kosar threw to RB Leroy Hoard, who rambled 65 yards for a TD. Stover’s extra point attempt hit the left upright and was no good, but Cleveland was now up by 16-0. Once again Philadelphia had to punt and, as the game headed into the second quarter, the Browns were on the move. 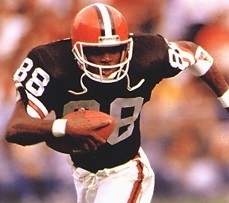 Kosar completed passes to Webster Slaughter for 14 yards, TE Scott Galbraith for 13, and WR Reggie Langhorne for nine yards to reach the Philadelphia 20 and, four plays later he connected with Slaughter for an 18-yard touchdown. Stover’s point after was successful this time and, following the nine-play, 54-yard possession, Cleveland held a commanding 23-0 lead. Now in a deep hole, the Eagles responded by advancing 80 yards in seven plays. McMahon completed two passes before RB James Joseph (pictured above) broke away for a 23-yard run. Facing third-and-seven at the Cleveland 38, the visitors benefited from a pass interference penalty on CB Anthony Blaylock that gave them a first down at the 19 and, two plays after that, McMahon threw to TE Keith Jackson for a 16-yard TD. Roger Ruzek converted and the Eagles were on the board, although still down by 23-7. The Browns had to punt following their series and Philadelphia quickly narrowed the score further when, on first down, McMahon passed to WR Fred Barnett for a 70-yard touchdown. Ruzek again made good on the extra point and the score was 23-14 with 6:47 left in the first half. WR Danny Peebles returned the ensuing kickoff 32 yards to give the Browns good starting field position at their 44, but two plays later a Kosar pass intended for Langhorne was intercepted by CB Ben Smith, who returned it six yards to midfield. McMahon immediately threw to Jackson for a gain of 33 yards to the Cleveland 17, but Philadelphia was moved back by a holding penalty on the next play. While McMahon completed his next three passes, the drive stalled at the four and Ruzek kicked a 21-yard field goal. The once-formidable Cleveland lead was narrowed to six points at 23-17. The Browns regained possession with 1:32 remaining in the half. Mack ran for 10 yards and Kosar then threw to WR Brian Brennan for 11 yards and Slaughter for 17 in a play that cost the Eagles Ben Smith (for the remainder of the season with a serious knee injury, it turned out). Kosar then connected on two passes to Langhorne, first for 23 yards and then for 24 yards and a TD. Stover kicked the point after and Cleveland took a 30-17 lead into halftime. The Eagles had the first possession in the third quarter and drove 60 yards in 11 plays. Joseph handled the bulk of the running and McMahon completed three passes, the longest to WR Calvin Williams for 30 yards. Ruzek booted a 37-yard field goal to make the score 30-20. The Browns went three-and-out, but Brian Hansen’s punt traveled 65 yards and went out of bounds at the Philadelphia four. McMahon quickly got the Eagles out of the hole with a pass to Barnett (pictured below) for 38 yards and a throw to Jackson had them nearly to midfield. Tosses to Barnett and Williams gained another 14 yards and, after Joseph ran for five yards, McMahon connected with RB Keith Byars for seven yards. A defensive pass interference penalty gave Philadelphia a first down at the Cleveland seven, but the drive stalled as three passes fell incomplete and Ruzek kicked a 24-yard field goal. The Browns punted after their next series and the Eagles had the ball as the game headed into the fourth quarter. They moved methodically and converted a third-and-12 situation with a 16-yard McMahon-to-Williams pass play. Joseph had a 21-yard carry to the Cleveland 22 but Jackson dropped McMahon’s next toss and another fell incomplete to set up third-and-10. Once again the Browns were flagged for pass interference and once again the Eagles were unable to reach the end zone after getting first-and-goal inside the ten. A 19-yard Ruzek field goal finished off the 13-play, 78-yard drive and narrowed the score to 30-26. Kosar completed a 14-yard pass to Slaughter to start Cleveland’s next series, but two sacks with an incompletion in between forced the Browns to punt. The Eagles had good field position at their 48 but moved backward thanks to a penalty and a sack and were forced to punt in turn. However, Slaughter, who typically didn’t return punts and unwisely fielded the ball at the one when it appeared certain to be a touchback, ran laterally and fumbled when hit by RB Robert Drummond. LB Britt Hager recovered at the Cleveland two. Joseph was dropped for a three-yard loss on first down, but two plays later McMahon completed a five-yard touchdown pass to Williams. DE Rob Burnett blocked Ruzek’s kick but the Eagles were in front by two points with 5:19 remaining in regulation. Another short series by the Browns resulted in a punt and Philadelphia, taking over with 4:28 to play, managed to control the ball for nearly the remainder of the game. McMahon threw to WR Roy Green for nine yards on a third-and-four play and yet another defensive pass interference penalty converted a third down. The Eagles finally had to punt, but there were only ten seconds remaining for the Browns to work with from their own 20 and two Kosar passes fell incomplete. Philadelphia won by a final score of 32-30. The Eagles, in overcoming the 23-point deficit, led in total yards (418 to 258), first downs (24 to 16), and time of possession (41:14 to 18:46) with Cleveland managing just 24 total yards in the second half as the Eagles adjusted and dominated on defense. The Browns turned the ball over twice, to one by Philadelphia, and while the Eagles drew 10 penalties, at a cost of 72 yards to 7 penalties for 86 yards on Cleveland, the Browns were flagged five times for defensive pass interference to significant effect. 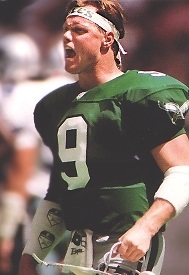 Jim McMahon completed 26 of 43 passes for 341 yards and three touchdowns while giving up the one early interception. Fred Barnett had 8 catches for 146 yards and a TD and Calvin Williams and Keith Jackson had identical totals of 6 receptions for 76 yards and a score apiece. James Joseph rushed for 89 yards on 20 attempts. For the Browns, Bernie Kosar was successful on just 14 of 33 throws for 246 yards and three TDs with one interception, completing only two of 13 in the second half. Webster Slaughter caught five passes for 74 yards and a TD, but his critical misplay of the punt in the fourth quarter drew the most comments. 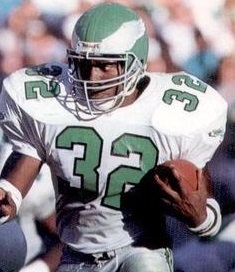 Reggie Langhorne (pictured above) was right behind in pass receiving yards with 73 on his four receptions that included a score. Cleveland gained just 25 yards on the ground and Kevin Mack accounted for 23 of them on 10 carries. The dramatic win against the Browns was the second of six straight, and seven in their last eight games, for the Eagles. Injuries continued to plague McMahon and, while the formidable defense was able to keep them in games, they finished third in the NFC East at 10-6, just missing a playoff berth. Cleveland placed third in the AFC Central with a 6-10 record. Jim McMahon started 11 games, with the Eagles winning eight of them, and completed 60.1 percent of his passes for 2239 yards and 12 touchdowns while giving up 11 interceptions. The 341-yard passing total against the Browns was the second-highest of his 15-season career. 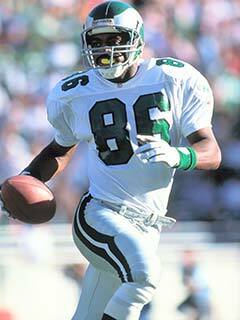 Fred Barnett caught 62 passes for 948 yards (15.3 avg.) and four touchdowns. Rookie James Joseph’s 89-yard rushing performance against Cleveland was his best of the year as he led the club with just 440 yards on 135 carries, averaging 3.3 yards-per-attempt.